Curiosity and sentimentality are the mortal enemies of those who wish to live uncluttered lives. Despite my sincere effort to clean out the garage last week, I lost my battle with those enemies, thanks to an old Nike shoe box with “’98 Baseball” written in Sharpie across the top. I found the shoebox in the first storage container I’d vowed to eliminate. Before I’d thrown away one single piece of junk, I found myself at the kitchen table, opening the box and shuffling through memories. 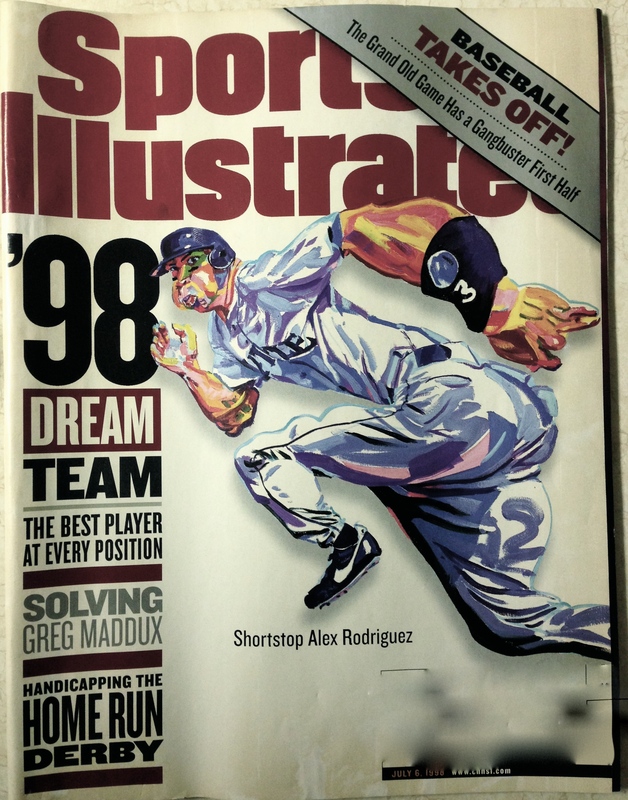 In the years since 1998, Alex Rodriguez has gone from cover story hero to morality tale. Strange, how prophetic this caricature seems now. For baseball junkies, 1998 was the summer romance gone sour. Four years after a devastating labor strike that cancelled the World Series, baseball finally made a comeback, thanks to several incredible moments. The Yankees won 114 games. Kerry Wood struck out 20 batters in a game. Cal Ripken ended his consecutive game streak at 2,632. But the story of the summer was the power. Mike Piazza hit is 200th career home run. Rafael Palmiero his 300th. Barry Bonds his 400th. Mark McGwire and Sammy Sosa embarked on an epic chase to eclipse Roger Maris’ single-season home run record of 61. Both did, Sosa at 66 and McGwire at 70. And in record numbers, America watched it all. Looking back, it all seems tainted—especially the power numbers. Of the top-ten overall home run leaders that year, seven have been linked to steroid use (Ken Griffey, Jr., being a notable exception). Fans were crushed, and in some ways we never recovered. Most of the great players of the 1990s will never sniff the Hall of Fame. Even a decade after the Senate hearings that brought the problem to light, the outcry against players of the so-called Steroid Era sounds like the sobs of jilted lovers. I can’t believe we fell for that! You lied to me. It was all fake. Nothing about it was real! Except that it was real—the experience, if not the authenticity of its creation. The game that year created intense drama, must-see TV. My shoebox was full of articles worthy of a Grantland Rice poem, gushing as they were over this new generation of heroes. Sports Illustrated wondered on its cover if this was the greatest year in baseball history. 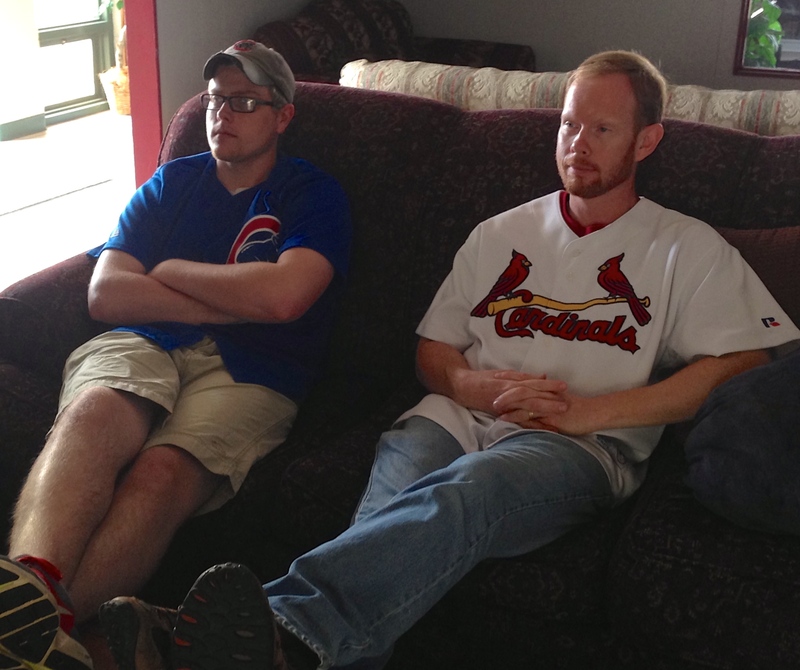 And we baseball fans—both casual and devoted—loved it. Maybe we shouldn’t have. Maybe we don’t want to. Maybe—no, definitely—it was bad for us and for our kids. But we loved it. Just like a lot of things that could kill us. Just like a lot of things that could cause us to be complicit in killing others. One way or another, we pay a price for willful blindness. I wish we could undo all the steroids that were flushed into ballplayers’ bodies in 1998. We would have had a much less spectacular season. But I’d be able to let my son sift through this shoebox without having to explain why something so great turned so awful. I can’t. But I will do what I can. I can save the shoebox, and the memories inside. I can try to remember who I was then, and who my heroes were, and how we were all flawed and need forgiveness. But I can also remind myself to keep my eyes open, and to teach my sons to do the same, as much as they are able. If I can do that, maybe the next box they open will contain the memories without the guilt. Call it living a dream, even if it’s only in my head. My Father’s Day present was a trip to the ballpark to see the Memphis Redbirds play, like we’ve done a dozen times every summer for the past several years. We know the team and the stadium inside and out, and have watched games from virtually every perspective. Zachary and I play a Father’s Day game of catch on the field at Autozone Park. This time, however, we got to see it all from a different angle. 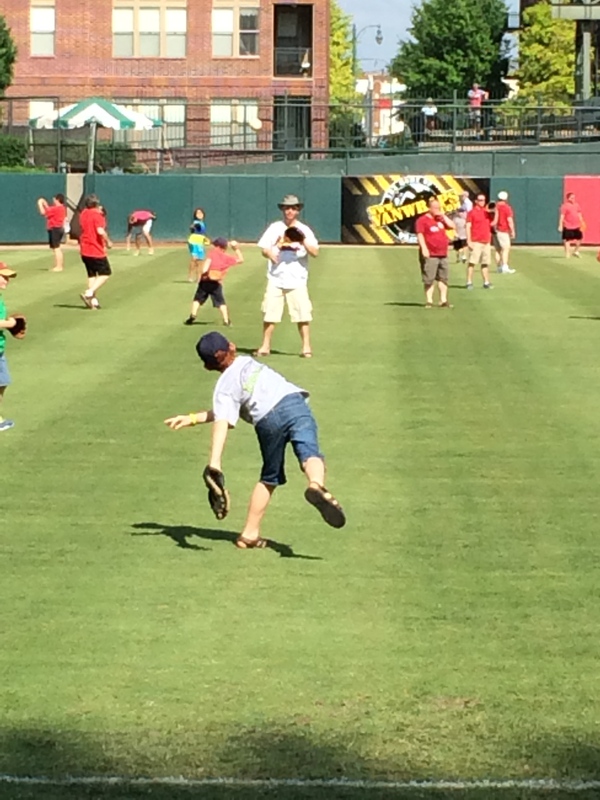 After the game, the Redbirds welcomed families to come onto the outfield grass to play catch. My two boys and I claimed some grass in left-center field and threw the ball around. Jonathan, the younger, made it about twenty minutes before deciding to call it a day. Zachary and I, baseball junkies that we are, stayed on the field. As the crowd thinned, I positioned him by the outfield wall and threw pop flies, as though he was Oscar Taveras going after a long fly ball. Ten minutes later, he wiped sweat from his forehead and rubbed his shoulder. We looked around. Fourteen thousand seats, now empty, but only an imagination away from being filled with fans. A glorious field peppered with other fathers and their sons, throwing baseballs to one another through all the dreams between them. Spectacular plays and errors. Home runs and strikeouts. Cheers and boos. I reached out to put my arm on Zachary’s shoulder, but I missed low. He is taller than I remembered. I reached my hand up. He squirmed away. But he didn’t back away toward the exit. Instead he ran past me, turned and tossed the ball my way. We went back to playing catch, and kept at it until last call from the stadium personnel. 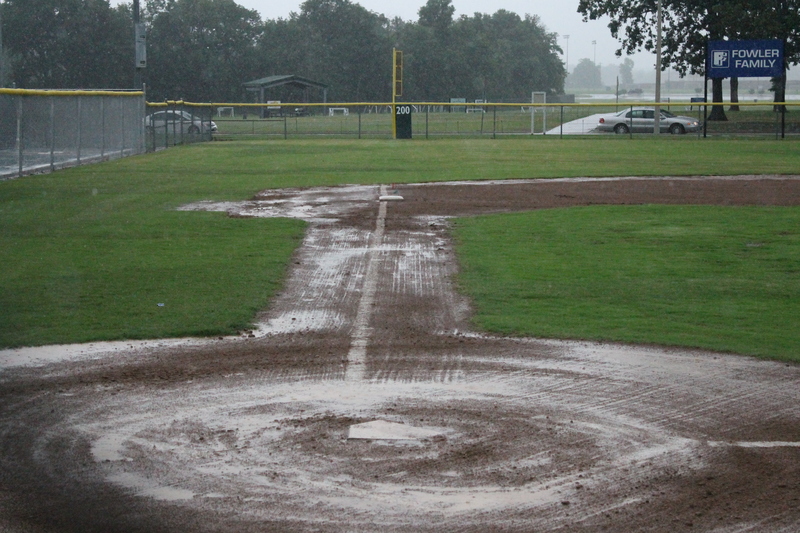 If we weren’t the last ones to leave the field, we were close to it. By that time, I had stopped my daydreaming too, at least for awhile. I may still envision alternate lifetimes in which I patrol center field for the St. Louis Cardinals. I may picture my son doing the same. If I do, I will certainly not think of the pain of the losses. I’ll imagine his success, even though I know that at his age he understands more than most. The game itself is his reward. It’s a privilege just to play. For the moment, that truth was, if only barely, within my grasp. It was enough just to play catch, a game with no winner or loser, nor with any substantial purpose. We didn’t need cheering crowds or menacing opponents. We had grass and sunshine, the pop of baseball into leather, the pleasure of feeling the seams of the ball against our fingers. Releasing it to flight. Watching it go. Trusting it would return. With the hectic schedule of spring, I almost missed the fortieth anniversary of one of the most unbelievable events to occur in my lifetime—and along with it a spiritual discipline that is in danger of extinction. Forty years ago this month, Henry Aaron hit is 715th home run to pass Babe Ruth on the all-time list despite racial slurs and death threats from those who, at the far edge of the civil rights era, still clung to the principle of African American inferiority. 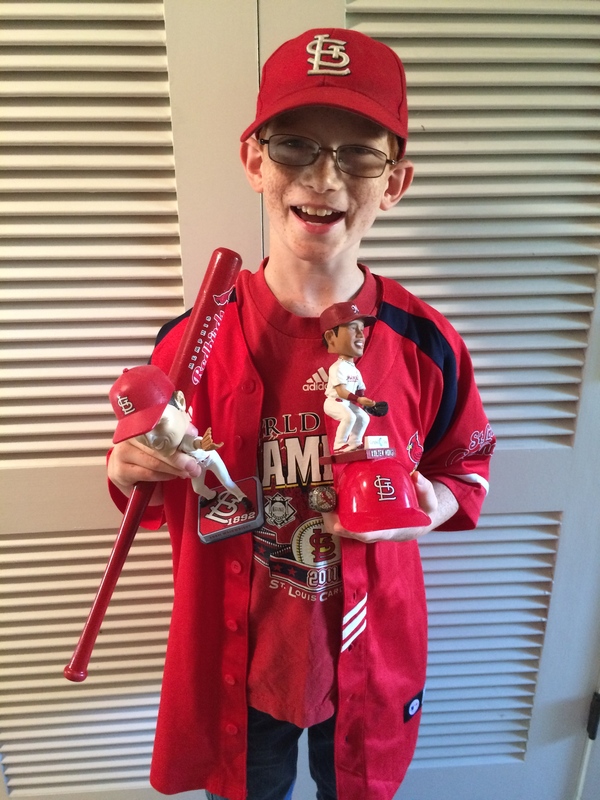 Even for the most colorblind of pure baseball fans, Aaron’s feat was hard to fathom. The Babe was one of the most colorful figures in American pop-culture. He hit 60 home runs in 1927—more than any other team in the league. He promised home runs for sick kids during hospital visits. In one of the most hotly debated moments in baseball lore, he allegedly called his shot in a 1932 World Series game. Babe Ruth was—and in some ways remains—larger than life. Contrast that with Hank Aaron. A quiet man who shied away from attention and controversy, He did not court stardom like Ruth. He stayed in the background among his own peers, lacking the flash of Willie Mays or the emotional displays of Mickey Mantle. Aaron never hit more than 47 home runs in a season. His totals seemed to sneak up on the baseball world, which made his overshadowing of the Babe all the more difficult for some fans to take. Consistency, it seems, is rarely the path to popularity. When applied to baseball, this principle means little. It is, after all, only a game. But when we apply it to Christian leadership, some sinister properties begin to emerge. In my tribe of United Methodist clergy, the pressure to be a superstar is enormous. Our administrative leaders have become increasingly enamored with numbers over the past few years—particularly those that indicate an uptick in religious market share. “Growth” as defined by professions of faith and worship attendance is the altar at which we pastors pray as we consider our next appointments. Although its application is often arbitrary, the stated principle is clear: unless you can produce numbers that trend upward, you are not worth much as a pastor. On one hand, I understand the thinking behind this. A big part of our job is to open doors through which people can encounter Jesus. I have known clergy who are unskilled or just plain lazy in that effort, and the cry for greater accountability often points to those few. But a larger number of my coworkers spill more than a little blood in the pursuit of faithfulness. They work for less than money than those with similar education. They sacrifice daily for the sake of the mission. Many of them have been doing so for years and continue to do so, despite the dearth of encouragement that has accompanied the rise in the cult of growth. How do we value such people, who sow the seeds of God’s love despite the rocks and weeds and birds that stand in the way of a visible harvest? Perhaps, as an institution, we don’t. A few years ago, I heard Richard Foster speak about maturing as a Christian. He brushed aside the quick programmatic approaches that are the backbone of many congregations. The interviews with Henry Aaron last week focused mostly on the moment of April 8, 1974, when he hit an Al Downing pitch out of the park for his 715th home run. But that moment would never have happened without years of hard work and consistent play. Such an oak as Hammerin’ Hank didn’t grow overnight. Neither does a lasting follower of Jesus. So while the world—and too often the contemporary church—continues to flit about from superstar to superstar, this seems like a good time to celebrate the less spectacular among us. It’s a good time to say thank you to those whose mark is not momentary success, but sustained excellence. Such are the people who make spiritual oaks possible. Time is not the enemy. As I settle into my fourth decade of life, I’ve more or less come to terms with the fact that time only moves one direction, and that this movement necessarily means loss. I will never get back the hair I’ve lost, the wonder of childhood, or my best time in a 5K. Then again, I will also never get back the shames of adolescence, the agonizing search for an adult identity, or the misery of the 1990 Cardinals. I suppose it’s a fair trade. I don’t always think that way, no matter how hard I try. Some losses are irrevocable and cannot be offset. And billion-dollar industries have sprouted up around our fear of further loss. One commercial break on my XM radio yesterday featured ads for a testosterone booster, an anti-aging cream, and a “can’t miss” investment in gold. We fear what time may steal from us, and we guard ourselves against it. Blayne and I celebrated opening day with several other Wesley students. Today, at least, every team has hope. But it seems we rarely stop to think about what time gives us–opportunity, maturity, direction, awe. We cannot see the vista without scaling the mountain. We cannot get back to our warm bed without leaving the vista. Moving through time doesn’t allow us to keep much, but neither does it leave us empty. For most teams, today is the opening day of the Major League baseball season. Whether teams are recovering from a lousy 2013 or, like my team, to build on a successful campaign, everybody gets to start the year fresh. And no matter how 2014 goes, we will all get to start new in late March 2015 also. I think, in their hearts, most baseball fans are optimists. We keep cheering in the hopes that something good will happen, regardless of what horrors befell us the previous day. Time washes away our trophies and keeps us humble. Time washes away our sorrows and gives us hope. So for today, anyway, I have a healthier perspective on time. It lets us start new. And God knows we need that. I am almost certainly naïve, but I don’t think I’m alone in this. In fact, I think almost anyone who love his (or her) job and does it well likes to work. I’ll go a step further. I like to watch other people work too—not in some sort of taunting, glad-that’s-not-me sense, but in a sense of admiration. It’s a fascinating thing to help my brother in his shop, given his ingenious (if sometimes unorthodox) solutions for how to get his tasks just perfect. I love watching Adam Wainwright and Michael Wacha pitch. I love listening to Buster Olney talk about baseball. When someone cares about what they do, I almost can’t help but watch, regardless of what tax bracket they occupy. 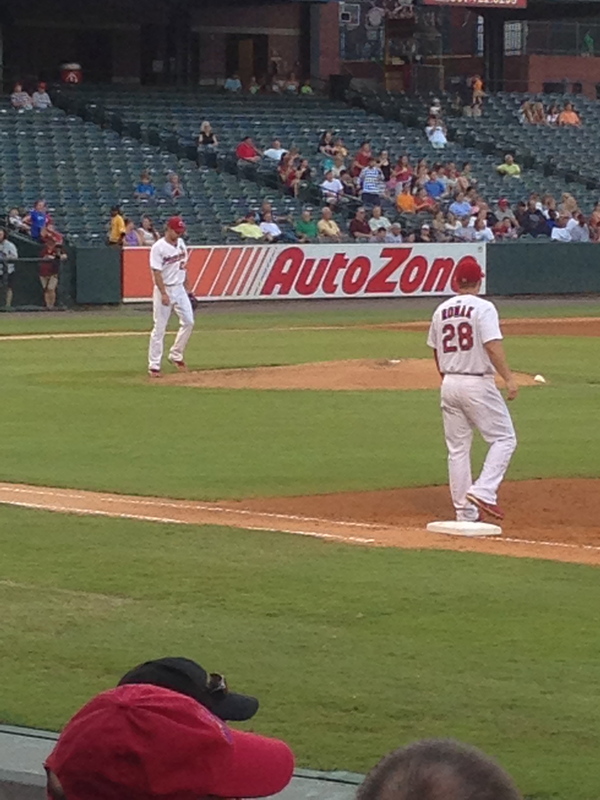 Michael Wacha became a star last year in St. Louis, but I got to see him play in Memphis. Obvious how much he loves his work. Sadly, I don’t hear this same kind of joy in their work among clergy very often. In fact, several friends and colleagues posted an article on social media this week that names “clergyperson” as the fifth most stressful job in the country. I believe that’s probably true. But it leads me to other, more somber musings as well. Before I go any further, let me say one thing clearly: I do not blame most of my colleagues for the stressfulness of our occupation. True, most of us could stand to take care of ourselves better both mentally and physically. Also true that, as a group, we have a psychological profile that lends itself to overwork and sensitivity to criticism. But that does not mean pastors are entirely to blame for the high stress level of our profession, nor the relative lack of joy so many of us endure. Congregations must shoulder some of that load, as must the hierarchies and administrative structures that cast such a long shadow over my own denomination. Still, any pastor worthy of the title will tell you that blame does no good whatsoever. The question is how to address the problem. And that proves a terribly difficult equation to solve. In healthy situations, pastors should be able to talk to their congregations about their struggles with ministry, whether that’s due to overwork or conflict or just the simple burden of caring for hurting people. Then both parties can work together to find a better way to live together. I suspect, however, that many of my colleagues don’t feel that freedom. They entered into ministry because they were captivated by the story of Jesus lived out among people. But the cares of this world—budgets, attendance figures, building management, minutia of daily life—keep them more than occupied with lesser things. They fear that letting those things slide will undermine their ability to lead, or somehow prove they are not good at their jobs, or worse, cause more conflict from demanding church members. I’ve been in those shoes, and some days I still put them back on. So while I know that what pastors who feel trapped really need is the perspective and discipline to change what things we can control, I also know how incredibly difficult that can be. That’s why trustworthy and honest collegial relationships are so important. Thankfully, however, today finds me in a different place. Arkansas State Univeristy has been closed all week due to icy conditions, and Wesley Foundation has also been closed. Today, I realize how ready I am to get back to work. There is much about campus ministry that I wish was different, but the time I get with students is not one of them. There are few greater thrills in my life than getting to guide, challenge, encourage, and otherwise disciple young adults on the college campus. So for me, the snow days have served as a reminder of how painful it can be to be a pastor, but also how wonderful it can be to engage in meaningful work. Here’s hoping the roads clear soon.